januari 2012 | 533 blz. In their search for better ways to enforce private and public legal rules, prevent damage, and compensate victims of grave wrongdoing, European legal scholars and policy makers show an increased interest in this particular private law remedy. 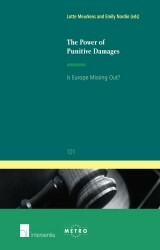 The twenty-two authors of this book reflect on the pros and cons, applicability, aims and limitations of punitive damages in terms of different legal themes.